Analysis: Lynn also mentioned Dylan Cantrell and Travis Benjamin, the latter of whom may ultimately be a cap casualty. Davis has a decent chance to stick on the 53-man roster for another season, but he's a long shot for the No. 3 wideout job after logging 74 snaps on offense and 173 on special teams in 2018. The Chargers would be wise to bring in more competition during the upcoming draft. Analysis: Davis played only 74 offensive snaps in 2018 and was targeted once in the passing game, but he played a heavy role on special teams. The 27-year-old seems likely to serve in a similar gig heading into the 2019 season. 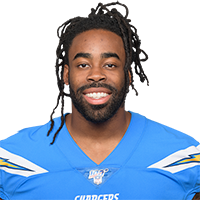 Analysis: Davis had made the Chargers roster the previous two seasons, so it doesn't come as much of a surprise to see the 26-year-old on the team once again. Davis will act as depth at the wide receiver position, but with a plethora of players above him on the depth chart, he's unlikely to draw much fantasy consideration. Analysis: Davis was the star of Saturday's contest, coming down with an acrobatic catch in the third quarter to score the team's first touchdown. It's unlikely the 26-year-old receiver will vault any higher than his No. 5 standing on the depth chart, but another outing like Saturday's might assure him a roster spot for a third consecutive season. Analysis: Davis has played in five games with the Chargers over the last two seasons, mainly as a special teams player. He'll act as a depth option at wide receiver, but his contract extension does not guarantee he'll make the final 53-man roster come the fall. Analysis: Since being promoted back to the Chargers' 53-man roster, Davis has made just one appearance for the team, logging six offensive snaps in the Week 13 win over the Browns. With fellow wideout Mike Williams (knee) back in the fold Sunday, however, Davis will don street clothes as usual. There are no videos available for Geremy Davis. Click here to view all videos.